This remoulade sauce recipe is sponsored by Gorton’s Seafood. All opinions are my own. There’s nothing like a good New Orleans remoulade sauce. 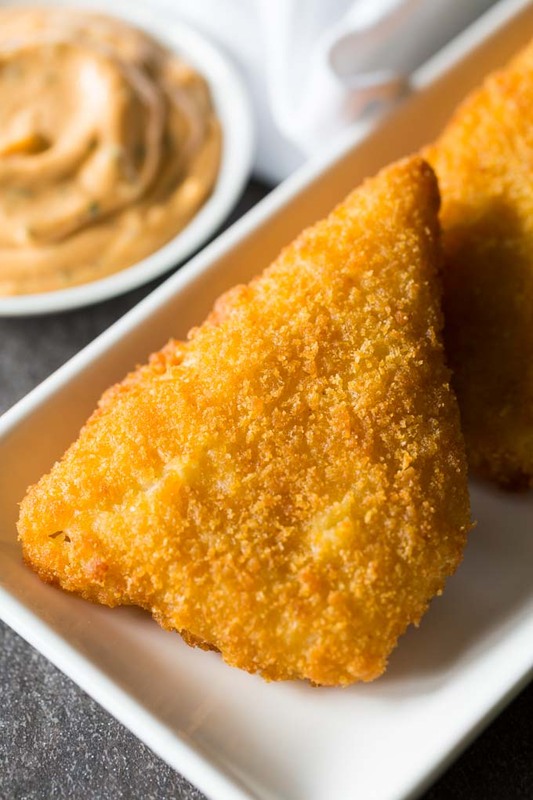 This simple, easy remoulade recipe is perfect for serving with shrimp, crab cakes, and fish. 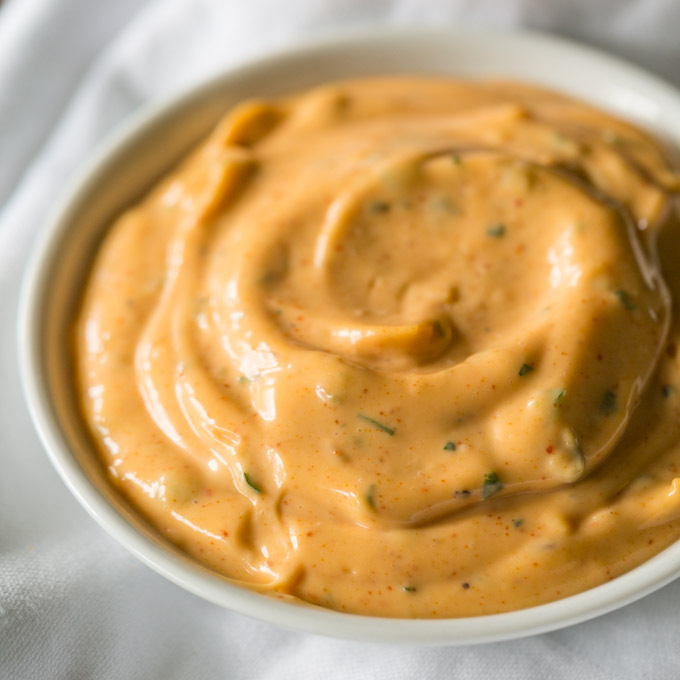 With the addition of paprika or ketchup, white remoulade morphs into the familiar light reddish-pink color, and this is the type of sauce that most of us think of when we think of remoulade sauce. Remoulade, in this form, is cool, tangy, rich, and fresh, with a pleasant trace of spice. Its combination of flavors makes it well suited for dipping and topping all kinds of seafood, from shrimp to crab cakes to fish. Like tartar sauce, it’s especially good with crunchy, breaded seafood. I like to pair this remoulade with fresh-caught, perfectly seasoned Gorton’s Seafood. I picked up some Premium Flounder Fish Fillets while I was at the store shopping for remoulade sauce ingredients. Gorton’s Seafood has been making quality seafood products for 167 years, so you know that any variety you choose to pair with your remoulade is going to be a winner. 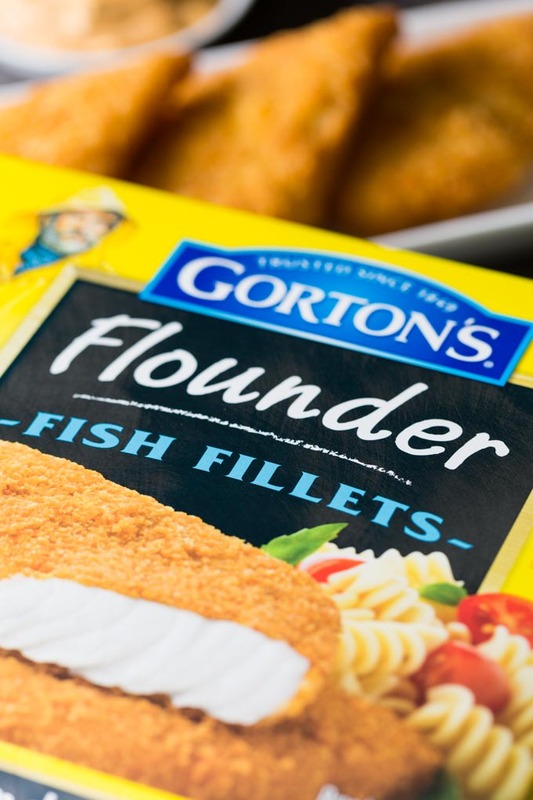 In addition to Premium Flounder Fish Fillets, you can pick from a range of Classic Favorites like Beer Batter Tenders and Fillets, Crispy Battered Haddock Fillets, Potato Crunch Fish Fillets, and many more. 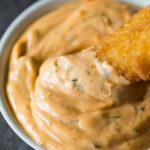 While I was working on this remoulade sauce recipe, I sat down and made a chart of all the possible ingredients from all the recipe variations I could track down. Here’s the complete list, in no particular order. Mayonnaise, mustard (Creole, Dijon, whole, and regular), sweet paprika, Cajun seasoning, hot sauce, ketchup, garlic, black pepper, salt, cayenne, lemon juice, vinegar, Worcestershire, horseradish, relish, parsley, onions, celery, pimientos, capers. I broke those ingredients down into categories for ease of combination and substitution (some can appear in more than one category). Most remoulade recipes include mayo and mustard plus one or more ingredients from each category. Red coloring: paprika, Cajun seasoning, cayenne, ketchup, hot sauce. Acid: lemon juice, vinegar, Worcestershire sauce, ketchup. Green stuff: relish, parsley, celery, capers. Powerful flavors: horseradish, garlic, onions, hot sauce. You can mix and match your ingredients, or make substitutions, by balancing the different ingredient groups. No paprika? Try ketchup or Cajun seasoning. No lemon juice? Try Worcestershire sauce. No parsley? Try relish. And so on. It’s very flexible and can be adjusted to taste. I mixed up an assortment of batches to see what I liked best. With an easy recipe like this, and Gorton’s Seafood, you can make a delicious seafood meal at home any night of the week. 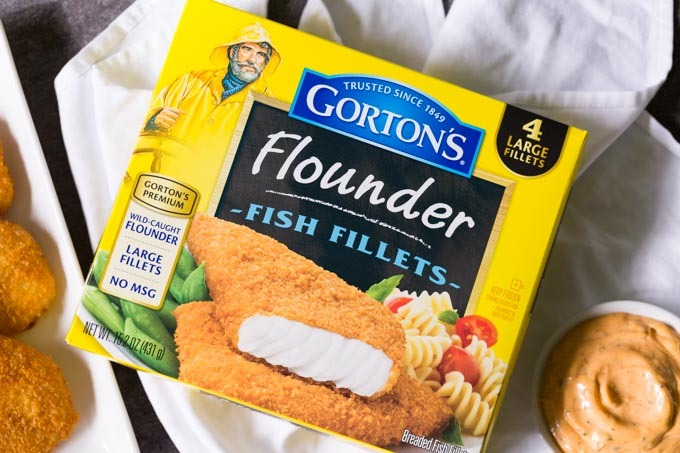 Look for Gorton’s Seafood Premium Flounder Fish Fillets at your local grocery store! 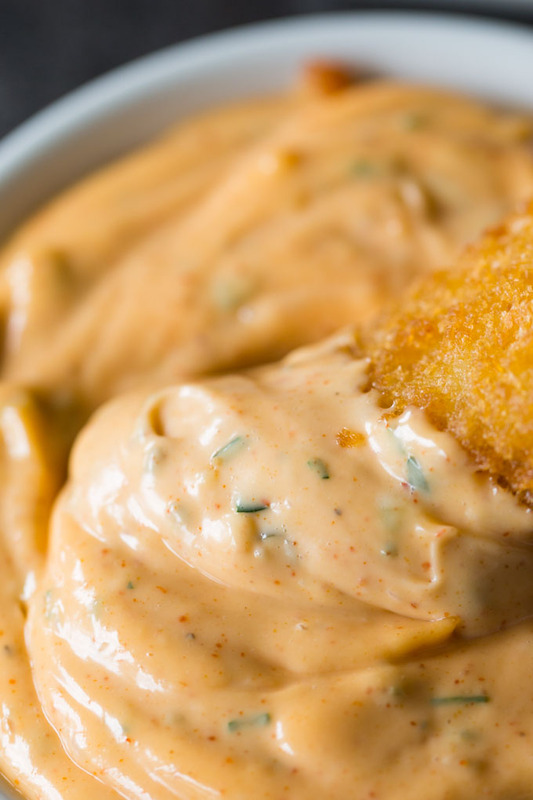 There's nothing like a good New Orleans remoulade sauce. 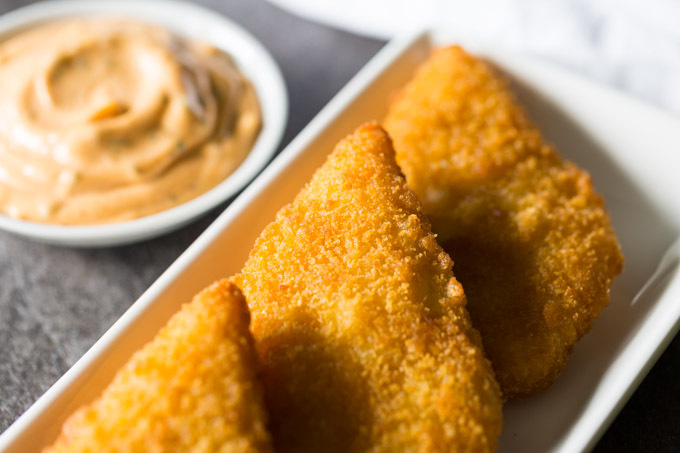 This simple, easy remoulade recipe is perfect for serving with shrimp, crab cakes, and fish. Combine all ingredients and stir together. For optimum flavor, cover airtight and refrigerate one hour before serving, but it is also fine to serve it right away. Try this remoulade sauce with all the delicious varieties of Gorton's Seafood. Love seafood? Try my recipe for Italian Shrimp and Vegetables! *Sources: Saveur and Nola Cuisine. You know, I have never actually known what remoulade is (other than tasty). Thanks for the education and totally sweet recipe! You’re welcome! I was surprised to learn about all the variations. I always get remoulade sauce with my fried shrimp when we go out to eat. Now I’m going to make it at home.